Ivo Daalder, former U.S. ambassador to NATO, addresses the audience during his talk “Donald Trump and the End of the Liberal World Order.” He discussed how Trump’s election may cause the international order to shift to a multilateral balance of power. Ivo Daalder, former U.S. Ambassador to NATO and current president of the Chicago Council on Global Affairs, said President Donald Trump’s “America First” ideology poses a threat to the United States’ international relations. About 35 people attended the talk hosted by the Buffett Institute for Global Studies in Harris Hall. 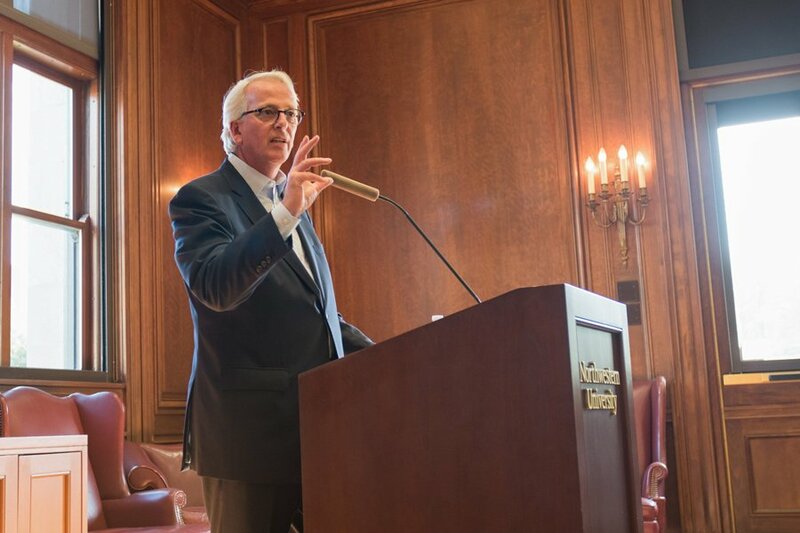 During the event, Daalder said Trump’s presidency is weakening the liberal world order, an idea that dictated the West’s political, social and economic policy following World War II. The second half of the 20th century was a time of immense progress for the U.S., both domestically and in foreign affairs, Daalder said. He added that the U.S. created the liberal world order, which led to reduced tariffs, an increased standard of living and the liberation of many countries. However, various forces have challenged the liberal world order, he said. The recent worldwide resurgence of populism is slowly fragmenting the international system, he said. Daalder said unequal distribution of the benefits of globalization, combined with a vibrant social media climate, led to Trump’s election. Trump bought his “winning ticket” to the presidency when he ran on a platform that successfully “exploited” the anxieties of millions of Americans worried about their future in a globalized U.S., he said. Daalder said a shift to a multilateral balance of power due to Trump’s policies may destabilize international relations. Barry Wolff (Weinberg ’75) told The Daily after the event he was pleased with the timeliness of the presentation because of the controversy surrounding Trump’s presidency. “This was a very critical subject, and it was a nice presentation of … a big subject, and it was very useful for people to listen to,” Wolff said. Bennett Lowenthal, a former foreign service officer with the U.S. Department of State, attended the event and told The Daily even though he enjoyed the talk, politics and globalization may not interest students because few attended the event. Lowenthal said he attended an event about robotics and art at the Buffett Institute a few years ago, and that event attracted more students. “It was the most crowded I’d ever seen, because that is where the interests of the younger generation lie,” he said.